On the heels of a recent military exercise that observers described as "unprecedented," Hamas leaders have called for some 100,000 Gaza Strip resident to engage in six weeks of mass demonstrations along the Israeli border as Jewish families gear up for the Passover holiday, which begins Friday evening. 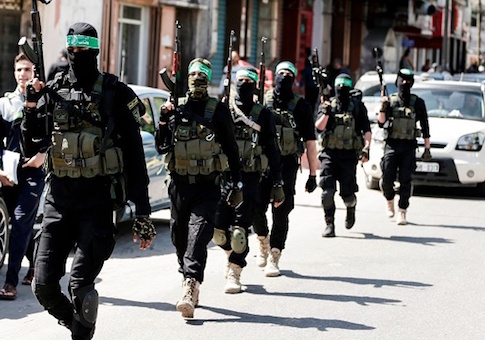 The State Department emphasized that it still considers Hamas a terror group and is aware of its routine use of human shields during terror operations. "Our position on Hamas has not changed," the official said. "It is a designated Foreign Terrorist Organization. Any use of human shields is absolutely unacceptable." "Meanwhile the U.N. is supporting Hamas and setting up Israel to get blamed for anything that happens to Hamas's human shields," Ceren said. "American lawmakers were already inclined to view the U.N. as biased and unhelpful when it comes to Israel and this can cement that view." U.N. officials have moved to put the onus for preventing violence on Israel in recent days. Nickolay Mladenov, U.N. special coordinator to the Middle East peace process, urged Israel to show restraint during the demonstrations, even if violence erupts. "The use of force by Israel must also be calibrated. Israel must uphold its responsibilities under international human rights law and humanitarian law," Mladneov was quoted as saying. "Lethal force should only be used as a last resort, with any resulting fatalities properly investigated by the authorities. I once again urge the security forces to exercise maximum restraint to avoid casualties." "I call on all sides to exercise restraint and to take the necessary steps to avoid a violent escalation," he was quoted as saying. "It is imperative that civilians, in particular children, not be targeted and that all actors refrain from putting children at risk at any time." Observers have been warning that Hamas is not seeking a peaceful protest, but a military campaign in the guise of civilian demonstration. "The plan is to build to a crescendo day by day until May 15, the day after Israel's Independence Day, when Hamas hopes tens of thousands of Gazan civilians, interspersed with some military folks, will storm the security barrier, an action that could provoke a forceful response from Israeli security," Tzippe Barrow, a Jerusalem-based correspondent for CBN News warned in a recent report. This entry was posted in National Security and tagged Hamas, Israel. Bookmark the permalink.